In Jesus we have the richest, most vivid picture of God imaginable. No longer does God seem implacably remote, displeased with the world he has made. Instead, he bends toward us, sharing our weakness and shouldering our burdens. Through the perfect offering of his life he becomes our Way back to the Father. He is the True Vine in which we abide, bearing fruit for God's kingdom. He is the loving God who will never abandon us, but who will be present with us always, leading us to life eternal. Praise God: For sending his Son to be the True Vine through whom the world would be saved. Offer Thanks: That Christ has made you a branch of the True Vine. Confess: Any disobedience that makes it difficult for you to abide in the Vine. Ask God: To prune you in whatever way is necessary so that you can be as fruitful as possible. Unable to find a decent job after graduating from college, I did what many people do — I went to graduate school. But shortly before obtaining a master's degree, I attended a job symposium on campus regarding my chosen field. The news was dismal. New jobs were hard, almost impossible, to find. The experts were advising new grads to settle for low-paying, menial jobs if necessary until the employment picture brightened. I felt my hopes for the future sinking fast. But then an old cliché flashed through my mind: "It's not what you know but who you know." Wait a minute, didn't I know the most powerful person in the universe? It couldn't be that hard for Jesus to help me find the job I needed. After all, I didn't need a million jobs — only one. A couple of months later I landed my first professional job, which proved to be the perfect entry into my career. You are connected to somebody who is not only the Alpha and the Omega, but the Nu as well. Alpha and omega are the first and last letters of the Greek alphabet; nu is the middle letter. Thus, Jesus is not only somebody who will be with us in the beginning when we're born and at the end when death comes. He abides with us in all that is between . . . in the middle. In the middle, when temptation comes to turn us around. In the middle, when Satan attacks to dismantle and destroy. In the middle, when friends become few. In the middle, when resources run short. In the middle, when the unexpected shakes the foundations of our lives. In the middle, when relationships are severed. Yes, in the middle. Therefore, we can continue to abide in Jesus. He is sufficient for whatever comes between our beginning and our ending. The kind of abiding that Jesus speaks of in John's Gospel is a lifelong abiding accomplished through faith and obedience. Furthermore, we abide not as a single branch, isolated from others, but in union with Christ and with other believers. Together we are branches of "the true vine." It is no accident that Jesus uses the metaphor of a vine to describe himself and his disciples. In Palestine abundant vineyards were considered a sign of God's favor. Vines, in fact, were labor intensive forms of cultivation that grew best in peacetime, producing grapes that could be eaten fresh or made into raisins, grape juice, wine, and even a jelly-like substance called honey. No wonder the vine was a symbol of peace and prosperity. Numerous times in the Old Testament, God had referred to Israel as a vine. But Israel was a wild vine that had failed to produce the rich harvest God intended (Isaiah 5:4). By calling himself the "true vine," Jesus was saying that he was the true Israel. Jesus and those who belong to him will fulfill God's plan for the world. For each of us, abiding in the true vine is a lifelong, sometimes painful process. Like branches on a vine, we have to be pruned so that we can be more fruitful in the future than we have been in the past. Apart from Christ we shrivel and die. But united with him we experience the God-blessed life, which, as Paul told the Galatians, produces "love, joy, peace, patience, kindness, goodness, faithfulness, gentleness and self-control" (Galatians 5:22-23). Indeed, we are called to bear fruit that will last. Today, ask God for the grace to recognize your true purpose in life, which is not to be blessed but to become a blessing, bearing the sweetness of Christ to all who are hungry for him. 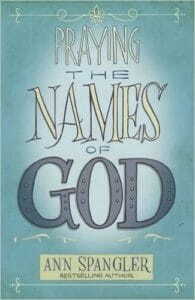 Two of Ann Spangler's most-loved books have been released in paperback: Praying the Names of God and Praying the Names of Jesus. 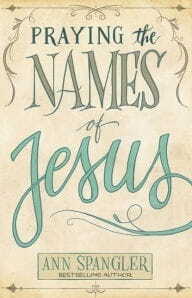 These books help us understand the biblical context in which these names and titles were revealed, and help us gain a more intimate knowledge of the Father and of the Son.